Fat gets a bad rap. It may be the most misunderstood macronutrient. The word “fat” is unfortunately associated with an unhealthy diet and excess weight. But your body needs dietary fat to function. They’re necessary for absorbing vitamins and minerals from your diet. Fats are packed with energy. You need them for building and maintaining healthy cells. They’re essential for nerve function. Learning how this macronutrient works in your body may change your tune about dietary fat. Let’s bust three of the biggest myths about this important macronutrient and discover a little bit about fat’s function, make up, and impact on weight. On the contrary. Fats are crucial for your health. Another word for fats is lipid. And they’re the foundation for cell membranes. Without these important coatings, your cells couldn’t function. Fats are also responsible for creating the sheaths that surround nerves. Think of it as insulation for the wires that carry impulses from your brain to all areas of your body. Lipids also make up an important part of your skin barrier. Like you read above, fat is incredibly calorie dense. It can deliver more than twice the energy per gram than carbohydrates or proteins. Some forms of dietary fats are stored as energy in easy-to-access packages. This energy production is vital for strong and powerful muscles. Not only is fat necessary for cellular and muscular health, your nutrition depends on it. Fat is required to get the most out of vitamins A, D, E, and K. That’s why they’re called fat-soluble. In order for the body to absorb these essential vitamins, fat molecules help them move through the blood stream. These fatty transports allow essential nutrients to reach the brain and central nervous system where fat-soluble vitamins do most of their work. Other vitamins and minerals your body needs are water-soluble. This means that after they are consumed (either in whole foods or through supplements) vitamins and minerals dissolve in water and are carried throughout the body in the blood stream. This is true for vitamins B and C.
Dietary fat isn’t just fat. It’s more nuanced than that. They fall into one of three categories—unsaturated, saturated, or trans. The categories are determined by the chemical structure of the fat—specifically the arrangement of hydrogens in the fat molecules. Fats are made of long chains of carbon and hydrogen called hydrocarbons. The location of each hydrogen atom along the hydrocarbon chain influences how the fat molecule behaves. For reference, hydrogen atoms that reside on the same side of a carbon-carbon bond are called cis-hydrogens. When hydrogens lie on opposite sides of a double bond, they are referred to as trans-hydrogens—that will become important below. These dietary fats are often referred to as “healthy fats.” They’re derived mostly from plants and include: olive, sunflower, and canola oil. The fats in avocado, almonds, walnuts, and fish are also unsaturated. There are two kinds of unsaturated fats, mono- and polyunsaturated. Monounsaturated fats have one carbon-carbon double bond in their chemical structure. Polyunsaturated fats have several of these double bonds. The double bonds of unsaturated fats make it difficult for fat molecules to adhere to one another. This results in mono- and polyunsaturated fats being liquid at room temperature. Unsaturated fats are called healthy and are beneficial for the work they do in your body. Both mono- and polyunsaturated fats help maintain healthy cholesterol levels already in the normal range. They do this by increasing the amount of “good” HDL cholesterol. 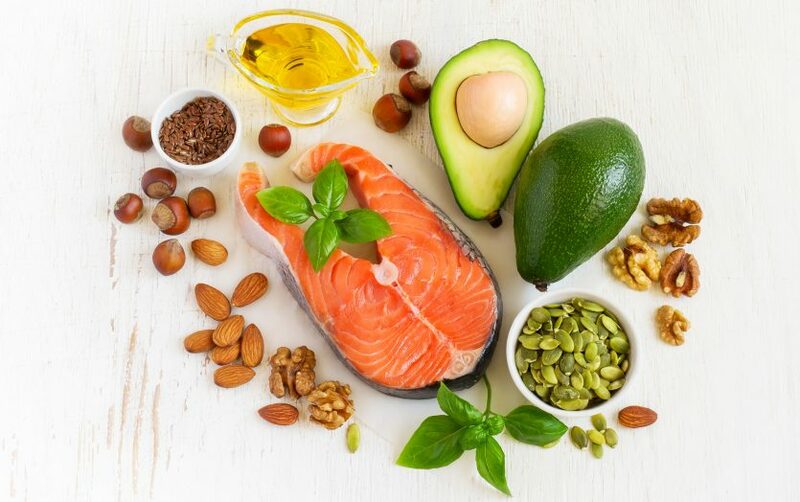 Unsaturated fats also help your body maintain healthy blood sugar—provided it’s in the normal range already—by supporting the function of insulin, an important hormone. Monounsaturated fats help your body cling to vitamin E, an essential nutrient many people are lacking. Vitamin E is a powerful antioxidant and can help protect your body from free-radical damage. Fish oil is a polyunsaturated fat that also supports your health. You’re probably familiar with the two most prominent fats in fish oil. They’re high in omega-3 and omega-6 fatty acids that help maintain and support cell structure. Your body can’t make omega-3 or omega-6 on its own, so your diet needs to supply them. Some are even considered essential. Saturated fat is literally saturated with hydrogen atoms. All of the carbon atoms in a hydrocarbon chain are bonded to a hydrogen atom. This means that there are no carbon-carbon double bonds in the fat molecule. Saturated fats are long and straight, with no kinks or bumps in the chain. This structure makes the hydrocarbon chain very sticky and allows it to combine easily with other chains. That’s why saturated fats are solid at room temperature. Because they adhere to one another easily, they can stack and build upon each other. This creates dense, solid fat. Watch your intake of saturated fats. They can be harmful when consumed in excess. Saturated fats reduce the “good” (HDL) cholesterol in your blood and can increase the amount of “bad” (LDL) cholesterol. They also influence the effectiveness of hormones in your body. Growing evidence suggests the hormone insulin is negatively affected by large amounts of saturated fat. By inhibiting the function of this hormone, blood sugar levels could become hard to manage. But removing saturated fat from your diet entirely could create some issues. Saturated fats are found in combination with healthier unsaturated fats in dairy products and lean meat. 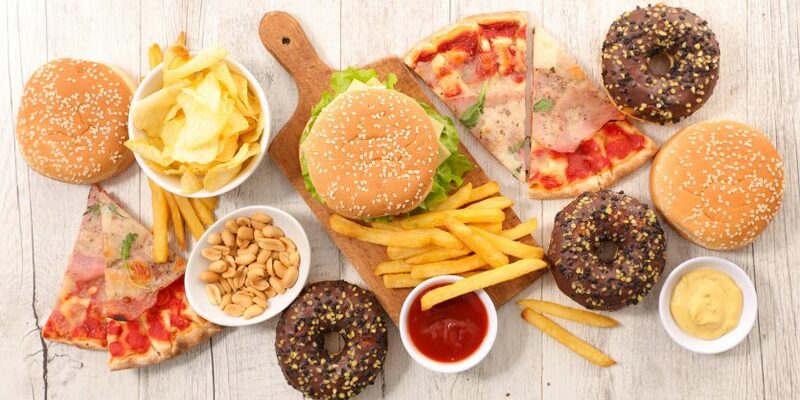 When saturated fats are eliminated from the diet, there is also a tendency to replace them with high-sugar foods. These foods do the same kind of damage to your blood cholesterol levels. Limiting your intake of saturated fats is a better way to manage your overall dietary fat. If you’re reducing the amount of saturated fat in your diet, replace it with healthy unsaturated fats. Here’s a fat that deserves the bad reputation. Trans fats are the worst for your body and are found everywhere. Prepackaged snack foods, baked goods—like donuts, cake, and cookies—margarine, and many fast foods contain trans fats. Some natural foods, like beef, also contain a small amount of naturally occurring trans fats. These fats get their name from the chemical bonds made between the carbon chains in each fat molecule. The name itself gives it away. Trans fats have a lot of trans-hydrogens in their chemical structure. This means the hydrogens found on carbon chains are located on opposite sides of the molecule. They don’t always come by this structure naturally. Most trans fats are created through a process called hydrogenation. During hydrogenation, healthy vegetable oils are heated in the presence of hydrogen. This forces hydrogen to attach to carbon chains in the trans-position. After this chemical treatment, once-healthy vegetables oils look, behave, and taste like saturated fats. This is done because hydrogenation also prolongs the shelf life of packaged foods, since trans fats don’t spoil easily. What does all this chemistry mean for your body? A lot of potentially negative effects. Trans fats are linked to increased levels of “bad” LDL cholesterol. These fats also impact your cardiovascular system, making it work less efficiently. Trans fats are also believed to reduce your body’s ability to process sugar correctly. Unfortunately, trans fats are incredibly easy to use and found in a lot of the favorite foods in a modern diet. Their prevalence in prepackaged food and convenience in cooking make trans fats hard to avoid. To steer clear of these bad fats, fill your diet with healthy fats from vegetable oils, nuts, and seeds. Replace trans fats in baking by opting for an unsaturated fat alternative. And ignore the temptation to snack on donuts and other prepackaged foods. If you’re worried about weight gain and getting in shape, dietary fats might be mistakenly eliminated from your diet. It is true that dietary fat consumption should be kept in balance. But the healthy fats in your diet do not contribute to weight gain more than carbohydrates or proteins. No single macronutrient influences weight more than another—some just provide more energy per gram. Eating more calories than your body needs during the day will lead to weight gain, whether the excess calories come from fats, carbohydrates, or proteins. It’s important to understand how your body utilizes dietary fat to know why it needs to be included in a healthy diet. Per gram, fats offer the body nine calories of usable energy—compared to carbohydrates and proteins, which provide four calories per gram each. Since fats boast more than twice the calorie content of proteins and carbohydrates, they should be consumed moderately. But not eliminated entirely. Healthy fats can also help you feel full for longer. Eating the correct amount of beneficial fat is possible—and different—for everybody. But let’s review what this consumption looks like for the typical, healthy adult. Current recommendations advise that 20-30 percent of daily calories come from fats. The best fats for your body are unsaturated fats (including mono- and polyunsaturated). Try to make unsaturated fats 90 percent of the fats you eat in a day. It is recommended that saturated fats be limited to less than 10 percent of daily fat consumption. Avoid trans fats whenever possible. Identifying saturated, unsaturated, and trans fats can be difficult. When nutrition facts aren’t available, this can seem impossible. Here are a few tricks for spotting the different kinds of dietary fats. Unsaturated fats are typically liquid at room temperature. Mono- and polyunsaturated fats are typically found in oils, especially those from plant sources. Vegetable oils, avocados, nuts, seeds, and fish are great sources of unsaturated fat. These foods are also excellent stores of omega-3 fatty acids, which promote heart health and vascular function. Saturated fats are solid at room temperature. Think of butter, lard, and shortening. Red meat is high in saturated fat when compared to leaner meats like fish and poultry. Whole-fat dairy products like milk, cheese, and yogurt also contain saturated fats. Trans fats are hard to spot because they are mostly man-made. They can also be easily confused with natural saturated fats. Trans fats appear on food labels as “partially hydrogenated.” They add structure, texture, and flavor to packaged and processed foods. Fried foods and baked goods are often prepared with ingredients high in trans fats. Fast food, donuts, and other prepackaged snack food are the main culprits of trans fats in your diet. Don’t cringe when you think of the fat in your diet. Instead, prioritize healthy fats and eat them in balance with carbs and protein. Dietary fat is essential for your health and should be valued as a resource. To promote your own well-being, include the recommended amount of beneficial fat in your diet.